The impression I get from people’s descriptions of their lives or careers is that many people (or at least the ones who talk about stuff like this) go for a big goal. They want to influence lots of people. They want to make a big difference. Sometimes it works out really well, but there are plenty of cautionary tales too: people who get what they strove for, but who’ve sacrificed their health, happiness, or relationships along the way. Anyway, an alternative might be to start small and build a solid foundation along the way. If I look around, I can see lots of good examples of this, although people some are more deliberate about it than others are. Instead of moving towards a specific, large goal that’s a big jump from your current positions, you develop capabilities and gradually expand in interesting directions. You start with a solid foundation of self-care. You cultivate a good community around you, and then you grow at a sustainable rate. I used to have hang-ups about opportunity costs or wasted potential. Now I reason that if I don’t get around to figuring out XYZ because I’m growing too slowly, someone else is probably going to figure it out, or it wasn’t needed anyway. I think it helps to think of some skills or areas you can improve at each stage, since you’ll be making progress on multiple stages all the time anyway. It’s not like you’ll master self-care and then move on to relationships. You learn a little of one, you try a little of another, and you build up different areas gradually. For example, I’m pretty happy with my self-care skills of understanding, being happy, learning, and reflecting. If I get better at health, everything gets better too. I’m getting the hang of enjoying vegetables, and I’m back to biking – yay! Similarly, I can practise getting better at thoughtfulness in close relationships, and at asking for help in terms of connecting with a small community. For expanding the communities I’m in, I can practise sharing tips and lessons learned. 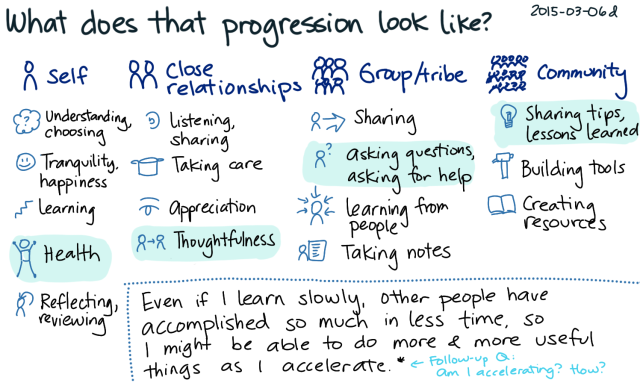 Another thought about slow progress: it might be okay even if I’m taking things more slowly than I think other people do (or that a hypothetical Sacha might do). If I’m accelerating, I can do interesting things later on. So, that leads to these questions: Am I accelerating? If so, how? Compared to myself from five or ten years ago, I think I’m improving my self-care skills at a faster rate. Learning more about tools for thinking has helped, and I’m picking up life skills too. In terms of close relationships, I’m accelerating in terms of W- and local friends, but not in terms of family and friends in the Philippines. 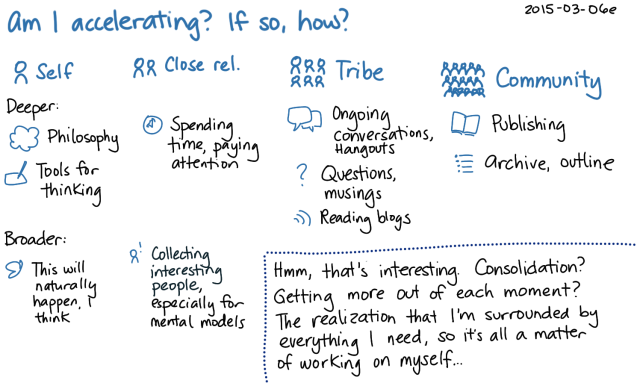 In terms of a tribe or small community, I think Hangouts accelerate things a little, and so does asking questions or thinking things through out loud. In terms of community, I accelerated more over the past few years (experiments with publishing and knowledge management) than I have in the past few months, but there might be ways I can play with that. Back when I was a whiz kid (probably like most people who were into programming at an early age), I occasionally thought about those fast-growth success stories like 30 Under 30 (or 40 under 40, or Young Presidents’ Organization, or…). There’s something to be said about being on the fast track, demonstrating momentum. The narrative is clear. The goal burns bright. It’s easy to prioritize. This other path of slow growth and neighbouring possibilities has its own challenges. It’s easy to get distracted and drift. I’m curious if I can do it well, and what I can learn from the process. I imagine that if it plays out beautifully, I’ll have a rich tapestry of a life while being able to trace the threads that connect the different sections. People are great at rationalization, so I can connect the dots going backwards. In the meantime, looking forward, I imagine that I’ll grow steadily and solidly, with the occasional leap enabled by trust and safety nets, and with a community of people I admire, learn from, and help. I imagine that my impact will grow as I develop my capabilities, so I don’t accidentally end up screwing up thousands of people’s lives or wasting millions of people’s time. 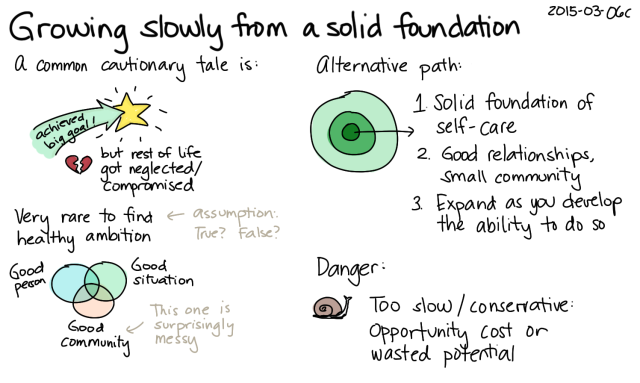 It might feel embarrassingly slow at moments (or even most of the time), as I take tiny steps or cover the same ground. But it’s a life, and it might be an interesting one. If I’m curious about this path, how can I explore it more effectively? I’ve sketched a few areas to focus on, so I can work on those. And then there’s reminding myself that it’s okay to write about the small steps, the lessons learned, the reviews… Let’s see how it works out!